Enda Kenny met with congressional leaders and presented President Obama with a bowl of shamrock as his US trip drew to a close. THREE DAYS LATE but better late than never as Taoiseach Enda Kenny handed over the traditional bowl of shamrock to US president Barack Obama in Washington DC last night. After holding talks in the White House Oval Room in the morning, Kenny and Obama travelled to Capitol Hill for a lunch with Speaker John Boehner and meetings with congressional leaders. Bohner remarked on the 100th birthday of his much-lauded predecessor Tip O’Neill, “a great-great grandson of Cork” who Boehner revealed harboured ambitions of becoming ambassador to the “Emerald Isle”. “Tip was so devoted to the Irish he once mused about becoming Ambassador to the Emerald Isle. To this, President Reagan responded, ‘Tip, the Irish aren’t looking for Speakers, they’re looking for listeners,’” he said. “In a show of solidarity, Tip invited Irish prime minister Garret FitzGerald to address the United States Congress on March 15, 1984. Afterwards a ‘St Patrick’s Day reception’ was hosted by Obama, Kenny and their wives, First Lady Michelle Obama and Fionnuala Kenny, in the White House East Room where the bowl of shamrock and a certificate of Irish Heritage were presented to president Obama. 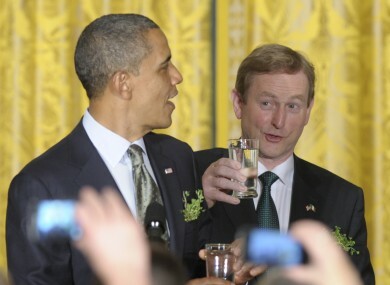 Email “In pictures: Taoiseach rounds off US trip with shamrock presentation ”. Feedback on “In pictures: Taoiseach rounds off US trip with shamrock presentation ”.